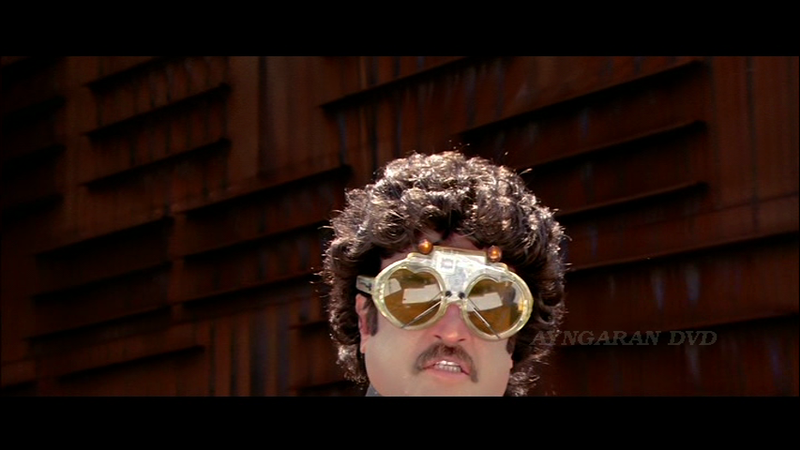 Sivaji is a wonderfully over-the-top film celebrating all things Rajinikanth. There are references to the superstar’s previous films and to his own life, plenty of classic Rajni style and he’s present in almost every frame. 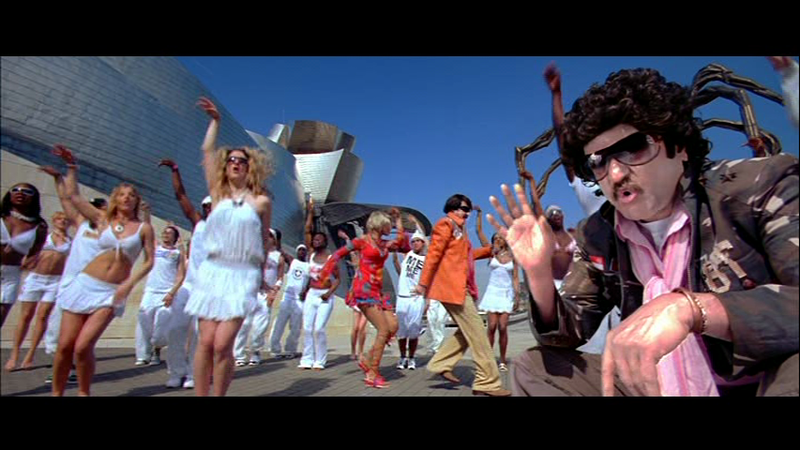 Sivaji also features stunning sets for the songs and a myriad of different looks for Rajinikanth throughout the film. While the story has an interesting plot involving corruption, the screenplay gets somewhat tangled in the numerous set-ups to introduce the next song or fight scene. But in the face of so much else that is fantastic, the disjointed nature of the story doesn’t seem to matter. When the first song is as much fun as this, then the film is already a winner for me. This features Nayantara in a cameo role along with an incredible number of men with round, jiggling painted bellies – I love it! 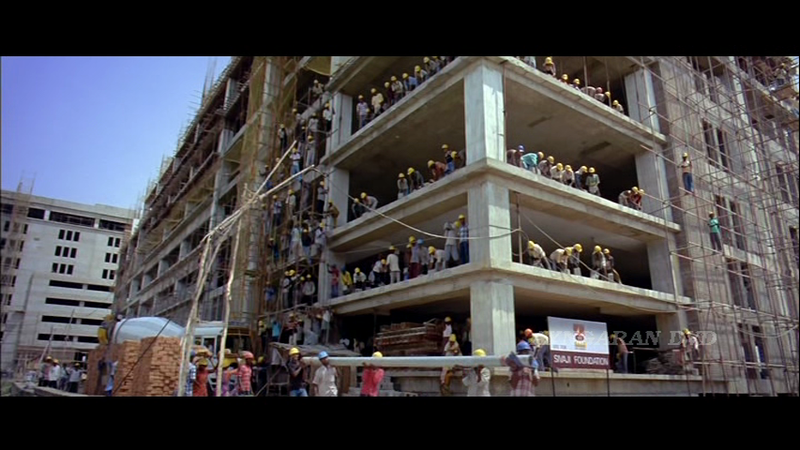 The film opens with Sivaji returning from the USA with truck-loads of money and deciding to set up a University and Hospital where everything will be available to the poor for free. His grand plans are opposed by local businessman Adisheshan (Suman) who blocks him at every turn. To make Sivaji’s life more difficult there is the practice of bribes and kick-backs that seems to be built in to the system at every stage. Despite his unwillingness to play along, Sivaji has no choice but to fall in line and pay everyone off if he wants to get his hospital and university built. I’m quite sure that all these people in yellow hats were the inspiration for minions in Despicable Me – or at least they should have been. 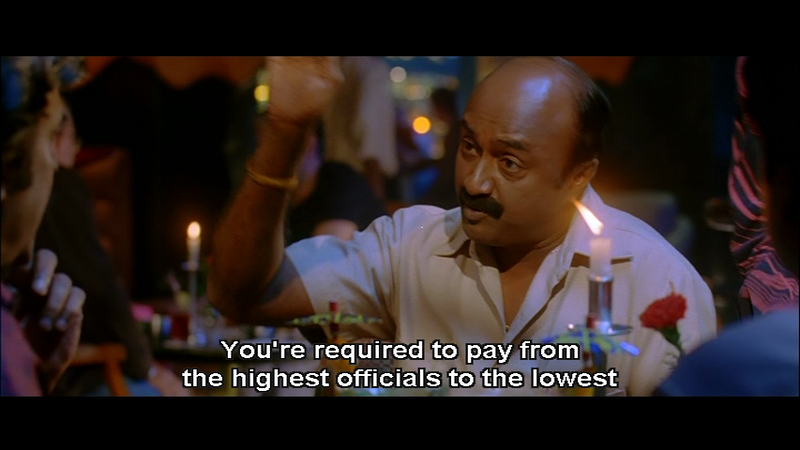 Ultimately this works to Adisheshan’s advantage when he contrives to have Sivaji arrested and charged in court. There Sivaji admits that he paid bribes to get permission to build and ends up losing everything. This might have been the end of the Sivaji foundation, but Adisheshan is the one person in Tamil Nadu who has no idea who he’s really dealing with and he rashly mocks his defeated enemy. This sparks Sivaji’s quest for revenge, and the 1 rupee coin Adisheshan tosses at him to start his begging career becomes a talisman and also funds the start of the fight back. 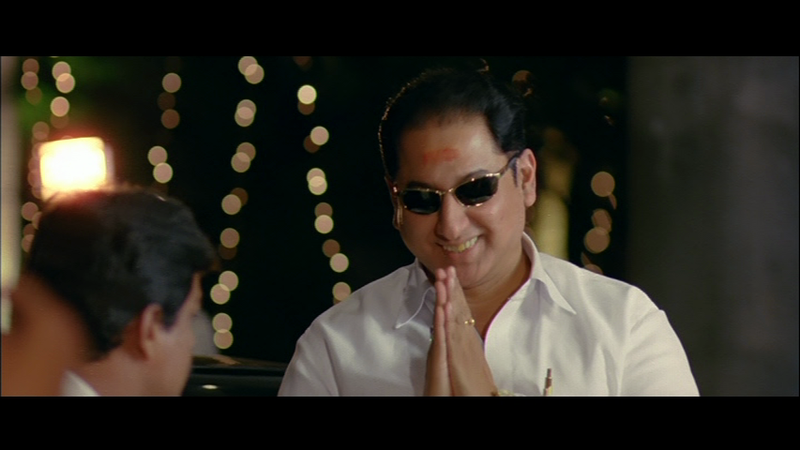 Sivaji devises a cunning plan to restore his finances and bring about Adisheshan’s downfall at the same time. Rajinikanth is truly in his element here as the crusading Sivaji. He still has his trademark tricks, but this new health conscious Sivaji spruiks the ‘cigarettes are bad for you’ message, catching mints and tossing his sunglasses instead of cigarettes. It’s all a little contrived, but the tricks are so much a part of any Rajni film that Sivaji would seem incomplete without them. There areplenty of fight scenes, and these are well choreographed by Peter Hein. The final showdown features some Matrix style action and Rajinikanth pulls it off with great style. If he has slowed down a little in some of the fight scenes and songs, well, that’s understandable but it’s barely noticeable. As well as the romantic songs, there is a fabulous sequence where Rajinikanth impersonates Sivaji Ganesan, MGR and Kamal Hassan and he gets really gets the mannerisms of the different stars very well. During the course of his crusade against corruption, Sivaji meets and falls in love with Tamizhselvi (Shriya) and despite her family’s initial reluctance and dire predictions of disaster from the priest, the two go ahead and get married. Thankfully Shriya is much less annoying than usual, perhaps because she is totally overshadowed by Rajinikanth, but I stand by my previous observations that the more clothes she wears the less irritating she is. Her main raison d’être here is to look pretty in the songs which she does very well. Other than her presence in the songs, Tamizhselvi is the ‘perfect Tamil girl’ of Sivaji’s dreams and that ensures plenty of traditional outfits and a fairly restrained performance, making her more tolerable than usual. Someone in wardrobe really does have a grudge against her though because she does appear in some of the worst outfits I’ve seen in the song ‘Style’. I’m not quite sure what to make of this song for many reasons. 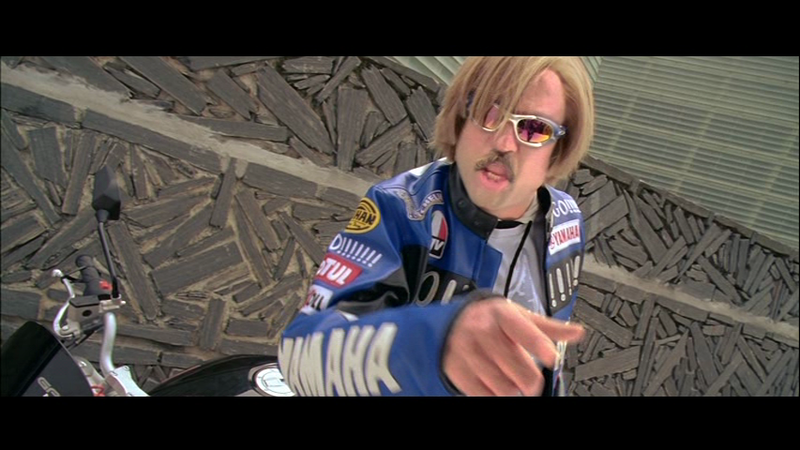 As a song extoling style it has some truly dreadful costumes and the whole white-skinned Rajni just seems very wrong. I’m always perplexed by the quest for paler skin in India, but then I’m equally as baffled by the drive for tanned skin among Europeans. I don’t like the melody or the lyrics of this song at all, but it does feature an incredible selection of amazing wigs for Rajni and is worth watching for that alone. Pick your favourite style! And the contrasting faces of Shriya. While the film deals with the theme of corruption, there is still plenty of comedy along the way. Although much of the humour comes from Rajinikanth and his various mannerisms, Vivek is excellent in his role as Sivaji’s uncle Arivu and provides many funny moments. Even though I’d normally cringe at Arivu’s match-making technique of parading girls in front of Sivaji, Arivu’s character is self-aware enough to make this funny rather than crass. There is more slapstick comedy in the scenes with Tamizhselvi’s family who disapprove of Sivaji and his exuberant family. The actor playing Tamizhselvi’s father (Pattimandram Raja) has some excellent expressions and I love the way he looks as if he smells something bad every time he sees Sivaji. On the other hand, Suman’s Adisheshan is a very mild mannered villain without any real evil tendencies. Although I’m sure this is meant to make sure that all eyes are firmly on Sivaji, he still seems rather unimpressive in comparison. His demeanour however is quite realistic as a businessman with political leanings and his reasons for opposing Sivaji are understandable considering how much the free hospital and university will cut into his profits. His methods of opposition are also consistent with his character and perhaps S. Shankar is trying to point out that corruption can be present in even the most reasonable appearing businessman. The second half of the film relies more heavily on the effects and gimmicks, and it’s disappointing that Vivek’s character gets more sidelined. But it’s still a lot of fun to watch mainly due to Rajinikanth’s performance. The music by A. R Rahman is excellent apart from the Style song mentioned previously, and the high budget of the film is easily explained by the song picturisations. The sets and costumes are totally fabulous and both Thotta Tharani as art director and K. V. Anand as cinematographer deserve the awards they received for their work. There are guest appearances by a number of established Tamil stars including Raghuvaran and Manivannan and the support cast are all very competent, although generally overshadowed by the superstar. Although Endhiran (S. Shankar’s latest film with Rajinikanth), had a bigger budget and even more special effects, I prefer Sivaji. 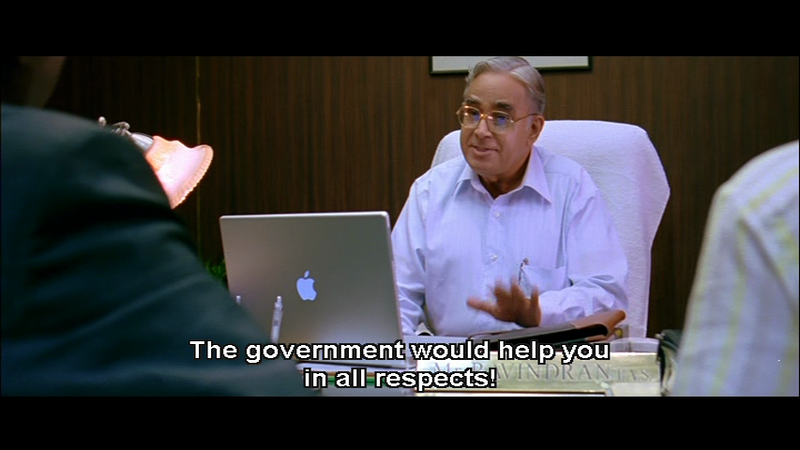 The story is engaging despite the way it jumps around and Shankar shows corruption within government systems in a way that seems quite plausible. 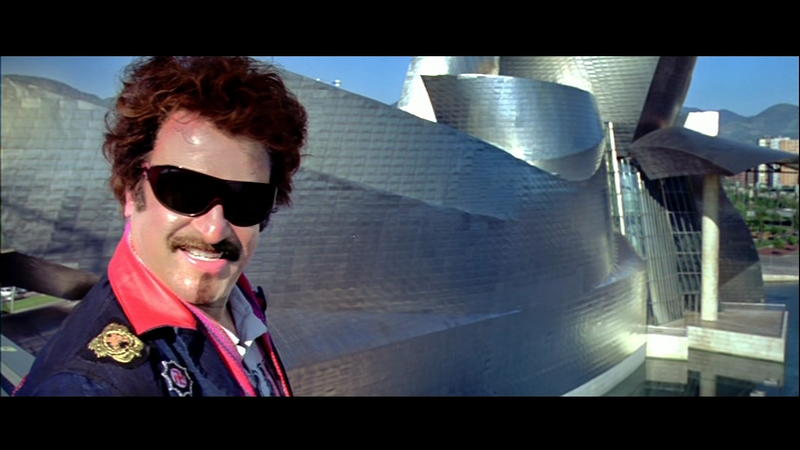 Even though the one man crusade requires a leap of faith, it is after all Rajni and so anything is possible. It’s one to watch for the lavishness of the sets and the larger than life presence of Rajinikanth. And for all those wigs! 4 stars. Temple says: Sivaji is what I have come to think of as a typical Shankar blockbuster in that it is all spectacle and very little plot. I think Heather is being overly kind in saying there is a theme to the story as I see it more as a collection of ideas that never really develops. Shankar introduces statements about corruption, the brain drain overseas as bright graduates pursue careers outside of India, the returning NRI and how they navigate between worlds, the obsession with all things American being seen as ‘better’ than local, the clash between tradition and modern living and the nostalgic ideals that may no longer exist. All interesting, and yet there is no real exploration of these notions as there is too much else happening. We move from fight to song to comedy to spectacular song and rarely pause for breath. It’s hugely entertaining, but it doesn’t really bear analysis. 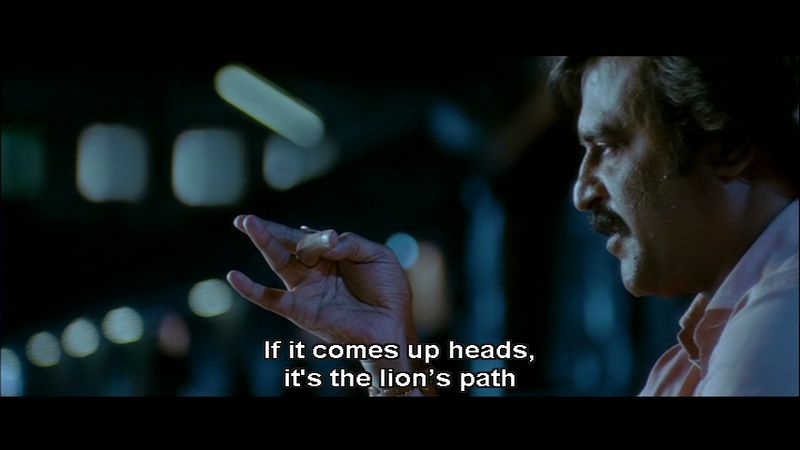 Rajnikanth is in excellent form and this is his film from go to whoa. Sure he is way older than his character, but it somehow works as he deadpans his youthful dialogues, daring you to not believe, and throws himself into the action with gusto. The fights have been tailored to suit him, and the music shop sequence is one of my all time favourites from any film industry. Shriya can range from terrible (e.g. Kanthaswamy) to pretty good, and this is one of her better performances. She handles the comedy really well (I love her expressions in the “Chandramuhki” sequence), isn’t completely overshadowed by Rajni, and does justice to the massive song sets and costumes. And she manages to look like she isn’t staring intently at Rajni’s wigs in the romantic moments so I decided Shriya may be a better actress than I had previously thought. See this for the spectacular sets and design, for a Superstar who can dominate the hyperactive pace and attention grabbing visuals, for the music (except Style) and for the filmi equivalent of a crazy amusement park ride. You’ll be dizzy and none the wiser at the end, but it was so much fun while it lasted. 4 stars! This entry was posted in Kollywood and tagged A.R. Rahman, K.V. Anand, Kollywood, Manivannan, Nayantara, Pattimandram Raja, Peter Hein, Raghuvaran, Rajinikanth, Rajni, Rajnikanth, S. Shankar, Shankar, Shriya, Shriya Saran, Sivaji, Suman, Tamil, Thotta Tharani, Vivek. Bookmark the permalink. 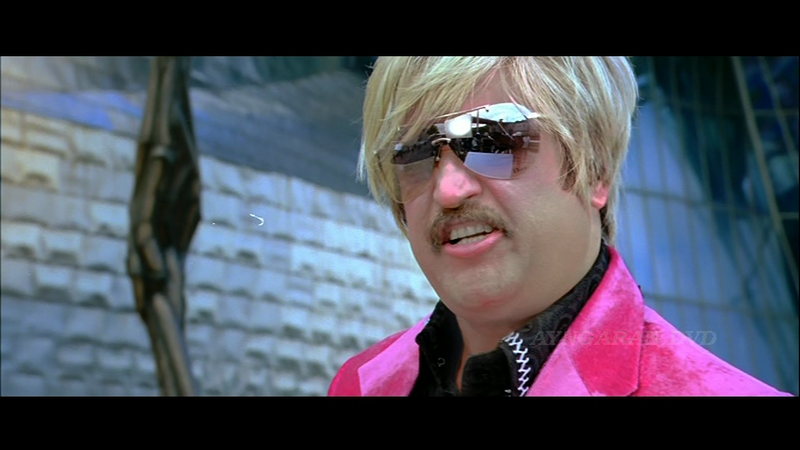 Hi H&T – good review of Sivaji the boss. I too liked the movie for the reasons you have outlined in your review. The dialogues bet vivek and Sivaji when Sivaji is trying to find the kind of girl he wants is truly hilarious and enjoyable – eg Vivek says – wear a dhoti and lets go to the temple – that is where you will find the kind of girl you are looking for – indicating that sivaji is looking for something which is no longer the norm! There are so many social issues this film raises, but I think they tend to get a little lost in the telling of the story. 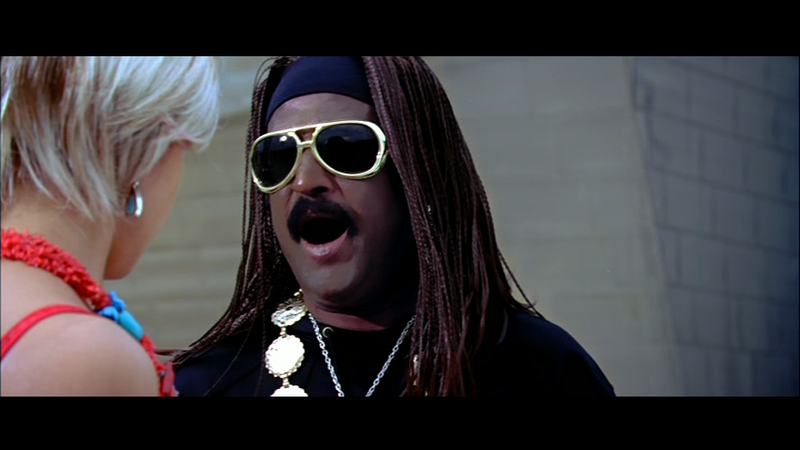 There is so much going on and Rajni’s Sivaji is a larger than life character who casts everything else into the shade. However I feel that it’s suppoed to be entertaining rather than moralistic and the film succeeds very well on that level. And maybe makes people think a little as well. Hi it’s Kavin: Another well written review by you as I appreciate your objective outlook of Tamil Cinema and yes Sivaji is a good movie with filler songs. In S. India, women are insecure about their looks and thus being fair is an issue there as darker women are perceived to be less attractive especially less marketable for arranged marriages. Yes Shreya is very beautiful but an average actress, but her looks make young Indian women especially in S. India insecure and self-conscious so it’s big issue. Don’t understand the craze in tanning by westerners either though it’s bad for your skin anyway. I don’t like Indian movies that keep perpetuating this belief you’re only beautiful if you have lighter skin as it’s not always true but is more of a generally accepted belief in young social circles in India. One thing is certain about Tamilians and Tamil films in general, which is Tamilians are over dramatic (esp in Films) but also in person I say this from experience and secondly Tamilians are very silly (esp overacting in Films). Tamilian films is basically utilize slapstick improvisation by senior comedians (Vadivelu) along with most of the actors in the films with exception of Vivek who uses deadpan humor (like American comedian Dave Chappelle) and his protégé Santhanam. Though Tamilans hold their language in high stature the good dialogue in movies (esp comedic) is overshadowed by silly plots and this is why I am happy Sivaji really brought unique realistic storyline into the mix along with the basic need for attractive women/ good music videos. Did you see Mangatha (a serious comedy haha)? But, does your site focus on Indian documentaries at all? I really recommend you see Marathon boy along with The Sound of Mumbai: A Musical if you have not already and you can write review for them as well (I only saw few clips on youtube but it was inspiring and moving). I hope I answered some of questions of why actresses with lighter skin tone are so popular in Indian Cinema. Kavin. Regarding the white skin, I thought it was odd that they would include this as comedy in a Rajni film since as you say it’s quite a big issue, but then again I guess it was to highlight the ridiculousness of it all. Whether it’s being thin, being white, being dark or whatever, women (and men) are constantly being put under a lot of pressure about the way they look. I did laugh when you said about Tamilians being over dramatic – I really do agree! When I’m in TN I work alongside a dentist and some of the reactions of people to having their teeth filled or pulled is so over the top and filmi I can’t help but smile 🙂 And if one person dramatically faints, then the next few all do as well! We don’t get the opportunity to see Indian documentaries here but I will keep an eye out for the ones you have mentioned online. Hi Heather. I misspelled it as it’s Mankantha (way too silly good for laughs though), but this movie is not really worth watching as much as Telugu movie Bommarillu (2006) with Genelia and Siddharth (both act well esp Genelia). See this movie it should come with subtitles as i needed it as well as Telugu is not my mother tongue. Its a very good movie i did not see it when it came out in 06 I just saw it recently as I am eager to write a viable screenplay for Indian cinema in a year based on reality not fantasy love like most Indian movies. Bommarillu is certainly the exception of romantic comedy like Minnale for Tamil Cinema. I saw both Sivaji and Range de Basanti on the flight to India three years ago as both movies utilize realistic plots based on genuine problems facing Indians and are a good alternative basic Indian Cinema’s distribution of incessant boring lackluster romantic comedies produced each year. I am happy your going to see the Indian documentaries i suggested you will get better glimpse of real India that most Indian movies are desperately trying not to expose to the world. I happy you read my blog initially and provided links to it with your blog, but i intend to make it public again once i have furthered myself professionally and intellectually to be in a better position to provide good discourse without sounding like a complete idealist but a realist with logical solutions as i want to be a good writer while also working for a non-profit organization. Enjoy the movies. Kavin S.
I’ve seen Bommarillu and enjoyed it, although I don’t think it’s all that realistic to be honest. However it has been a while since I saw the film. I think Telugu films are a little too light and fluffy to be realistic and they seem to prefer a happy ending. I agree that Rang De Basanti is a good film with excellent performances from the cast as well as an interesting and different story. Thanks for your comment. Brilliant dialogue!